What was it that inspired you to create the podcast, and how quickly did it take off ? Lynsey: Originally I wanted there to be a voice and a platform for women to have opinions about football and for football fans to engage. I’d spend time with my friends discussing football, and I just felt there wasn’t anything being broadcast like that. The first idea was quite different, but I realised after having a chat with Kait and Hayley that it’d be good for a few weeks to just talk football for a bit, to try out the podcast, and as it’s gone along the idea has developed and become fine-tuned. A year on it’s still going strong and it’s been an exciting, fun project. Lynsey: We’ve just hit over 150,000 downloads. We started last October, so not even at the beginning of the season, and we started from nothing to something really quite good in the broadcasting world. We’ve launched our website at the beginning of this season, we’ve had a lot of positive response from the industry, and it seems a lot of people really like the idea that this is happening. It’s all done in our free time because we believe in it, and we hope that it’s going to go on. It’s our way of being able to create the work that we want to see out there. Hayley: We’re getting regular people listening again and again, it’s starting to grow and get bigger. We’ve been nominated for a blogging award, and just to know that it’s nominated amongst others that have been going for a good few years that have a massive fanbase, to think ours is doing the same amongst other podcasts that we respect and enjoy – is really a big achievement. So you’ve created something there was a requirement for? Lynsey: At the moment it seems unique for three women to be talking about football , it stands out – but in a few years it won’t be and we’ll have started something. 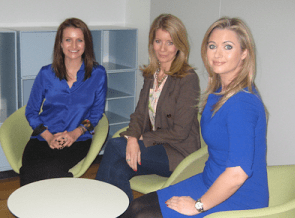 Hopefully more girls will think – ‘that’s a good idea’, and develop a podcast of their own, and it will grow further. It’s not about competition, we’d quite encourage people to go out and do the same. Do you have any advice for some of our readers who may be interested in sports journalism? Hayley: Not being afraid of it, and not worrying that you’re someone that’s terribly different in thinking that you want to do it. Don’t ever give up thinking, If I’m not playing football then how can I be writing or talking about it. It’s good to speak up and be involved, even if you don’t play football. How about acting as a referee or linesman? Maybe the manager or a spokesman for a team? Refereeing is a really interesting way of learning about the game. Even if you don’t play football, it shouldn’t stop you from writing or talking about it or getting a bit more involved in it the many ways which you can these days. Kait: You can be who you want to be and do what you want to do, and you don’t have to make any changes to your personality. It doesn’t make you boyish just because you like football, it’s for everyone. It also happens that a large percentage of women who are now big achievers in business have been involved in team sports at some point in their education, so there are other benefits. You learn valuable skills by working as part of a team. There are now also a lot more girls studying sports journalism which is really promising. 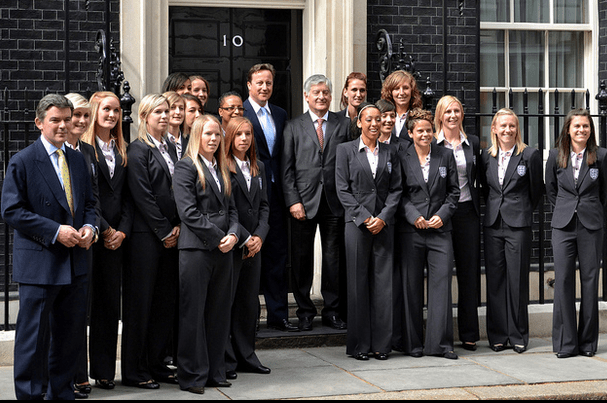 The Women’s England team as pictured with Prime Minister David Cameron in 2010. Will it be England’s time to win in 2014? What do you think we can be doing to give the Women’s Super League more attention? Lynsey: It seems to be growing and going in the right direction, we’re getting 5 to 6000 attending cup final matches for the WSL this year, so those sorts of numbers are quite exciting, but there’s still so much to do. There’s the 5 year plan for the WSL set out by the Football Association – so there‘s good time for it to grow. It gives us time to get things right, and I think there will be success on the international stage and that will filter down to the WSL. I feel that the first win win for England at a major tornament will come from the women’s team, I wholeheartedly think that it will. to football from the podcast ? Lynsey: At the moment we stand out because we are three women talking about football, and so people are curious. Also with us three, we’re friends and from our recordings you can tell we have a dynamic. There’s an element of personality to it, and we need more women personalities in sport. Things have changed a lot even in the past 5 years that I’ve been reporting, From when I started, I was one of the first women in the press box and now there’s always a few. Now on my twitter account people tweet me and genuinely value my opinion on football, quite different to a while ago when it was a lot harder to be heard. Kait: We’re fun and we’re not for results, predictions and specifics. For us, rather than about giving a match report it’s look at some of the talking points of the game, insider gossip, great stories for football fans. It isn’t a football lesson, it’s a football chat. It is and should be fun, accessible and easy to understand. The Offside Rule (We Get It!) is a finalist for Best podcast at the Footbal Blogging Awards. To vote, please tweet ”I am voting for @OffsideRulePod in @FBAs as Best #FootballPodcast, or click this link to vote by leaving a message on the site. Voting Closes November 17th.